Carlos Hathcock is perhaps the most famous American sniper out there. Chris Kyle would probably be the only other sniper with as much notoriety. 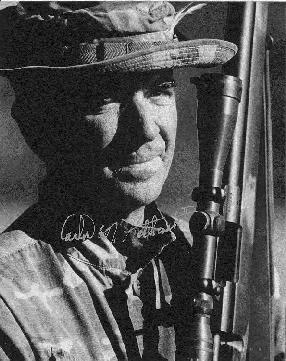 Much of his popularity is well deserved as his legendary exploits during the Vietnam war set him apart as perhaps the most pure of the successful snipers. By pure we mean someone who is a master of the fieldcraft and not just the marksmanship and the way he operated is what comes to mind when someone thinks of what a sniper does. While he was a world class marksman, having won the Wimbledon Cup 1000 yard competition against the best in the world, he was more a Hunter Of Gunmen (HOG) in its purest sense. He did not glorify or revel in killing, he was just very effective at protecting his fellow soldiers. There were others during the Vietnam War who had more confirmed kills, but it would be hard to prove there was anyone better. On Feb 23, 1999, at about 6:00 AM EST, Carlos Norman Hathcock II passed away. He is remembered as a true American Hero, a legendary sniper, and a gentleman. Below you will find some reading from various members of society that came about after he passed away. He truely was a legend in his own time. His confirmed kill of the Vietcng general where he had to crawl half a mile through grass being patrolled by enemy soldiers. Take the shot, then escape back through open grassland with all hell breaking loose and survive, was a courageous master at his peak. I was a Marine after him. I shot four expert rifleman badges. I wished I doul have met him. He is my hero! I got out as a sgt with 4 expert badges and an honorable discharge.I retired from post office after 30 years of handling perforation charges and explosives w/o accident. God bless your family and ooorah for the CORPS! I had the honor of meeting Carlos twice in Las Vegas. Once at the S,H,O,T, Show, and once at the Soldier of Fortune convention. Carlos took the time to visit with me and share some small talk. I was lucky to have known Carlos, if only for a brief time. My father’s uncle allegedly built him a custom rifle for sharpshooting after the Vietnam war. I’d like to learn more about it or possibly find it and buy it. If anyone has any leads it would be much appreciated.